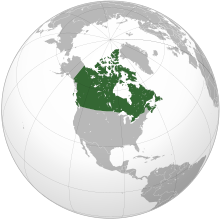 Canada is a country in the northern part of North America. Canada is the world's tenth-largest economy as of 2016[update], with a nominal GDP of approximately US$1.52 trillion. It is a member of the Organisation for Economic Co-operation and Development (OECD) and the Group of Eight (G8), and is one of the world's top ten trading nations, with a highly globalized economy. Canada is a mixed economy, ranking above the US and most western European nations on The Heritage Foundation's index of economic freedom, and experiencing a relatively low level of income disparity. The country's average household disposable income per capita is over US$23,900, higher than the OECD average. Furthermore, the Toronto Stock Exchange is the seventh-largest stock exchange in the world by market capitalization, listing over 1,500 companies with a combined market capitalization of over US$2 trillion as of 2015[update]. For further information on the types of business entities in this country and their abbreviations, see "Business entities in Canada". This list shows firms in the Fortune Global 500, which ranks firms by total revenues reported before March 31, 2017. Only the top five firms (if available) are included as a sample. 250 Manulife $40,238 34,500 Multinational banking, financial services and insurance carrier in Toronto. Manulife is the largest insurance concern in Canada. 266 Power Corporation of Canada $38,286 30,259 Diversified international management company primarily focused on the financials sector and including holdings in telecommunications and media. Subsidiaries include Power Financial, Gesca and Great-West Lifeco. 290 Magna International 36,445 155,450 Global automotive supplier and one of the largest automobile parts manufacturer in North America. Supplier to the Ford Motor Company, General Motors, and Tesla, Inc., the firm operates in 29 countries. 293 George Weston Limited $36,211 195,000 Diversified food processing and retail distribution firm founded by George Weston in 1882. Includes supermarket chains under the Loblaw Companies umbrella and the Wonder Bread brand of bread. This list includes notable companies with primary headquarters located in the country. The industry and sector follow the Industry Classification Benchmark taxonomy. Organizations which have ceased operations are included and noted as defunct. Bell Canada Telecommunications Fixed line telecommunications Montreal 1880 Telecom, part of BCE Inc.
Bell MTS Telecommunications Fixed line telecommunications Winnipeg 1905 Telecom, part of BCE Inc.
Cellcom Communications Telecommunications Fixed line telecommunications Montreal 1985 Part of BCE Inc.
CTV Television Network Consumer services Broadcasting & entertainment Toronto 1961 Television, part of BCE Inc.
Dairyland Canada Consumer goods Food products Burnaby 1992 Purchased by Saputo Inc.
Flickr Technology Internet Vancouver 2004 Photo sharing website, part of Yahoo! FortisBC Utilities Multiutilities Kelowna 1897 Power and gas distribution, part of Fortis Inc.
Glentel Consumer services Specialty retailers Burnaby 1963 Phone retailer, part of BCE Inc.
Central business district in Toronto. Tour de la Bourse home to the Montreal Exchange. Air Canada Boeing 777 in Toronto. ^ "World Economic Outlook Database". International Monetary Fund. April 18, 2017. Archived from the original on June 24, 2017. ^ "Latest release". World Trade Organization. April 17, 2008. Archived from the original on June 5, 2011. Retrieved May 23, 2011. ^ "Index of Globalization 2010". KOF. Archived from the original on May 31, 2012. Retrieved May 22, 2012. ^ "Index of Economic Freedom". The Heritage Foundation/The Wall Street Journal. 2013. Archived from the original on June 29, 2013. Retrieved June 27, 2013. ^ "Jonathan Kay: The key to Canada's economic advantage over the United States? Less income inequality". National Post. December 13, 2012. Archived from the original on May 15, 2016. Retrieved December 14, 2012. ^ "Canada". OECD Better Life Index. OECD. 2014. Archived from the original on February 18, 2015. Retrieved February 13, 2015. ^ "TMX Group Equity Financing Statistics – September 2014". TMX. September 2014. Retrieved February 7, 2015. ^ DeCarlo, Scott (20 July 2017). "The Fortune 2017 Global 500". Fortune. ^ "Royal Bank of Canada: Private Company Information". Bloomberg. Retrieved 2017-12-09. ^ "Advanced Cyclotron Systems, Inc.: Private Company Information". Bloomberg. Retrieved 2017-12-09. ^ "Affinity Credit Union: Private Company Information". Bloomberg. Retrieved 2017-12-09. ^ Nielsen Business Media, Inc. (31 March 1979). Billboard. Nielsen Business Media, Inc. pp. 146–. ^ "Blackburn Radio, Inc.: Private Company Information". Bloomberg. Retrieved 2017-12-09. ^ "The Boyd Group, Inc.: Private Company Information". Bloomberg. Retrieved 2017-12-09. ^ "Concentra Financial Services Association: Private Company Information". Bloomberg. 2016-09-30. Retrieved 2017-12-09. ^ "Conexus Credit Union Limited: Private Company Information". Bloomberg. Retrieved 2017-12-09. ^ "CTC Bank of Canada: Private Company Information". Bloomberg. Retrieved 2017-12-09. ^ "Dart Flipcards, Company Information". Dart Flipcards. Dart Flipcards. Archived from the original on 5 February 2003. Retrieved 9 December 2017. ^ "FGL Sports Ltd.: Private Company Information". Bloomberg. 2011-08-18. Retrieved 2018-02-08. ^ "Fort Garry Brewing Company Ltd.: Private Company Information". Bloomberg. Retrieved 2018-02-08. ^ "Kodiak Coil Tubing Ltd.: Private Company Information". Bloomberg. 2006-03-31. Retrieved 2018-02-08. ^ "Memotec Inc.: Private Company Information". Bloomberg. 2004-05-31. Retrieved 2018-02-08. ^ "Nexient Learning Canada Inc.: Private Company Information". Bloomberg. 2002-01-03. Retrieved 2018-02-08. ^ "Premium Brands Holdings Corporation: Private Company Information". Bloomberg. Retrieved 2018-02-08. ^ "Synex International Inc.: Private Company Information". Bloomberg. Retrieved 2018-02-08. ^ "Tahera Diamond Corporation: Private Company Information". Bloomberg. 2008-01-16. Retrieved 2018-02-12. This page was last edited on 30 January 2019, at 10:28 (UTC).